This book has been a result of seven years of research, and is addressed to teachers, directors and managers of educational and training centers, and anyone who is interested in improving the processes of teaching and learning as well as, the quality of education from the classroom. The book covers in a profound way all that education professionals can understand by the term “quality” with a focus on teaching/learning processes and teacher professional development, without forgetting school organization and the educational community. This text is a true manual to understand the current quality systems and systems related to excellence in education, as well as devices used by management, institutions and agencies to verify the learning outcomes and the assessment of school centers. 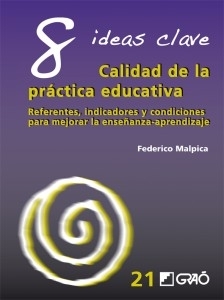 The book presents a clear structure to allow the reader to identify benchmarks, indicators and conditions to keep in mind so that the quality is really educational and a model of professional development can be implemented by any kind of school or training program, in order to achieve continuous improvement of their educational practice. 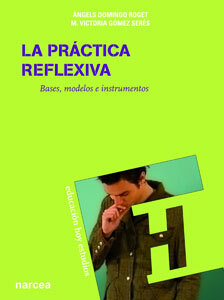 It presents an Interesting research that validates the training effectiveness of a reflective model – the innovative R5 method – which has been intended for the initial training of teachers, but is also valid for the professional development of experienced in-service teachers, at all educational levels. The book introduces a professionalizing training proposal that initiates from experience through systematic reflection and collaborative learning leading the teacher to learn from their own practice and promoting the improvement of their teaching practice. The author provides the conceptual basis of reflective practice and experiential learning presenting a comprehensive, rigorous and updated synthesis on the role, possibilities and their epistemological basis. Angels Domingo is the creator of R5 method and has led, with the support of her team, the successful implementation of this methodology at various universities in Europe and America. This book, practice-oriented , is directed to teachers, trainers, educators, education professionals and heads of educational institutions, interested in enhancing their professional development through reflection based methodologies. 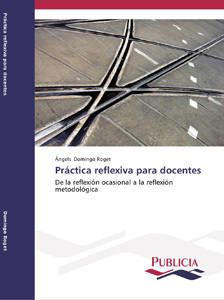 Offers a rigorous conceptual basis on what exactly reflective practice and reflective learning, and analyzes the potential of the educational experience for the Personal and institutional development . And this for show and teach the reader to turn occasional reflection and systematic methodological reflection to reverse in practice improvement. This is certainly an innovative educational proposal that achieves a deep joint of theoretical knowledge and practical knowledge. The book contains training proposals, models and tools to undertake practical and reflective practice guide individual, group and institutional. The proposals are unpublished, prepared by the expert authors, and successfully tested in different countries with teachers in the different stages and levels of education. They have also been applied to other groups as the methodological reflective practice is valid, in turn, to other professionals. The educational diagnosis is the first specific analysis tool designed for teaching and learning processes. It allows teachers to go through a process of introspection which enables them to identify improvements in the short, medium and long term. It is carried out through the development of a strategic plan to strengthen the pedagogical leadership of the management teams and the awareness of the teaching staff. It allows beginning a journey of based improvement leading the institution to meet their educational goals. Teaching can be hardly improve if indicators or grounded stable protocols are not available to recognize good practices and to identify the most appropriate teaching strategies for achieving the educational goals. What are the most common errors in the systems approach to quality management applied in schools today? An article with a different view of the education quality observed from the classroom. In this regard, the concept of quality is strongly reaching education and training centers. Nobody denies that quality oriented to process management of an organization is necessary because “if we keep doing the same things, we will get the same results”, isn’t it true? Nevertheless, at the classroom level (understood as the space where learning and teaching takes place): Who provides the indicators to determine when a practice is more or less appropriate? Who determines the management system for assessing the results, performance, and which enables to apply the improvement cycle in the classroom? Educational Self-diagnosis: Reflection on implementation experience at Thau School in Barcelona. Through this interview we present the experience of implementation of self -disgnosis in a schoo centerl. Frederic Raurell, principal at Thau School in Barcelona, ​​explains and evaluates its utility, process and results. Does education quality depend on our <> as teachers? Teaching competencies and complexity of society increasingly determines our educational practice. Among other things, it forces us, as teachers, to agree if we plan to improve the quality of teaching/learning processes and, consequently, the educational results we can get. However, the challenge is to agree on the most appropriate common educational practice in terms of educational aims of the center we have to help meet its goals among all, as a teaching team. How can we do this? What affects us? This article is about the foundations of Escalae system, indicators and procedures to identify appropriate educational practices, and to create continuous improvement processes in the classroom. How are educational processes improved on a quality management system? What benchmarks and indicators should be taken into account? This article is about the solitude legacy on educational professionals which determines their educational practice. This article is about the importance of institutionalizing the educational practice when we want to improve our students learning outcomes. These common teaching habits, can only be achieved through a systematic work of teachers as a whole. The implementation of an Intellectual Capital Management System for the university professor: key to efficiency in training. Another important element to consider is the selection and introduction of teachers in the organization. Only a good trainers’ induction in organizations can substantially improve the quality of learning activities, since in training, there are no opportunities for “pilot testing”. An efficient induction system will raise the possibilities of transfer the acquired skills to the job. What prevents quality from reaching the classroom? The educational self-diagnosis is the first analysis tool for the teaching and learning processes and allows teachers to carry out a process of self-reflection and the identification of improvements in the short, medium and long term, through the development of an strategic plan to strengthen the educational leadership of the management staff, as well as the teaching faculty awareness and initiate a path of based improvement, leading the institution to meet their educational goals.